Animated Colour Changing Background for Blogger - Today I am going to teach you how you can make your background change to different colours with animation using keyframes CSS. Inspite of using big images you can use these CSS codes which load extremely fast and you the user too gets too see some interaction on the background. The live demo of this design hack can be seen by click the button below. The demo ofcourse looks awesome so in order to add this animated background in your blog/website follow the below steps. First of all you have to remove the existing background code to avoid any conflict in between and minimize excessive code. For this search the body selector from the CSS codes in your blog. Under that search for background property and remove the property with the value (Do Not Remove the Selector). In case you don't know what selector, property and values in CSS codes are refer to the below image. After adding the code, save the template. You are done now. 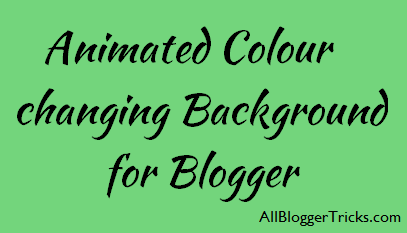 Now you and your visitors can see this animated colour changing background in your blogger blog. Hi Dhiraj, I just wanted to ask you that will a change of my blogger template affect my search rankings or traffic ? I don't know what other experts say but as far as I am concerned, my answer is No. Content is king and always will be. A template of a blog shows how it looks and how it works. Yes there might be slight change in rankings if you don't add crucial things like Meta tags in your new/updated template. Well first of all Dhiraj thank you so much for this post and honestly I have no idea regarding this post earlier and the information that you have shared through it. For sure I am going to use it. Keep posting and keep growing. This is the best community for discission about any topics and sharing best ideas, knowledge and thought. and have great Article sharing platform. I like this concept. Thanks a lot of all. I want to thank you for this great article. Its an informative and effective article. I also learning this your post. Now, i want to know about Background Removal Service. I hope, you will be published Background Removal related article.